What can you, and younger readers, expect from BioFables? Some background: BioFables started out as a collection of children’s books that incorporate sciences and humanities into entertaining stories. As such, they are a hybrid: not purely entertainment, but not purely educational either. The term “edutainment” also doesn’t quite fit: roughly fifty pop-up mini-lessons (mostly in the sciences realm) are woven into each book. Six of the twelve planned Series 1 children’s books and the Companion for Book 3 have been published so far. Children and adults tend to approach spontaneous learning differently. Children encounter pop-up lessons whenever they observe and interact with the world around them. Insects, gravity, history, poetry and all sorts of new information flows unsorted into childhood memories. As adults, though, we’ve learned to sort out and catgorize information, to make sense of the knowledge we’ve acquired. Since each of the BioFables books offers dozens of mini-lessons, it made sense to design a useful way for parents and teachers to sort out and categorize those lessons. And so, the concept of Companion Books was born. 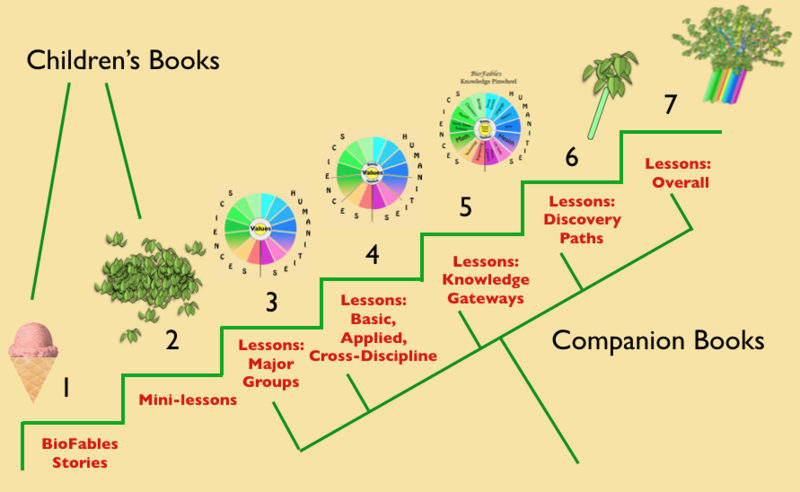 The graphic below outlines the steps from BioFables story content to each book’s lessons and their categories. After reading the process, you may be inspired to create your own steps for organizing lessons in other books. 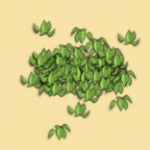 The ice cream cone and the leaves represent two different levels of BioFables story content following twins Melody and her brother Mallory on their family mini-trips. 1) You might think of reading as a way of consuming a book’s content, purely for enjoyment. Just like enjoying an ice cream cone without thinking a whole lot about it. The cone also offers nutrients (granted, the ice cream cone offers many fewer healthy nutrients than a kale smoothie, but it’s also not quite as much fun). 2) Why did we select a pile of leaves to represent the dozens of “nutritional” mini-lessons that each of the BioFables books contains? Well, suppose we surrounded the name of each mini-lesson dotted line to differentiate it from other mini-lessons. If we selected fewer than half of the mini-lessons contained in just one BioFables book and bunched them together, it would look like this! What’s important for very young readers is learning that the sun rises in the east and sets in the west, and that adding water to sand builds better sand castles than using dry sand alone. Textbooks offer organized lessons, in an orderly manner. Lessons in stories, as in life, pop up here and there. BioFables Companion Books aim to simplify matters for parents and teachers by identifying and organizing BioFables’ mini-lessons in a colorful, memorable way. Steps 3-7 show the evolution of the structure used in the planned BioFables Companion Books. Please note that the first Companion (for Book 3, Sand Sack) is an experimental version. 3) Why a pinwheel? First of all, we like the form of a pinwheel because of its multiple vanes. 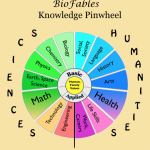 Sciences and Humanities subjects balance the BioFables pinwheel’s vanes on either side, while the Values pivot in the center enables the pinwheel to spin. The function of a pinwheel is to spin in the breeze. (Of course, you can also make your own breeze by blowing on the pinwheel or holding it and swooshing it around.) Pinwheels work best when they’re balanced. If one of the vanes on either side is bent or missing, your pinwheel may still spin but it won’t spin very smoothly. Let’s talk briefly about STEM and STEAM. “STEM” refers to Science, Technology, Engineering, Math (the left side of the pinwheel). Some educators and others have added Arts to STEM, to get “STEAM.” Not everyone agrees with this addition to STEM, however. The studies of a well-rounded person would likely include history, language arts, and other segments of the body of human knowledge not represented by STEAM. So, to balance our pinwheel, we divided the entire realm of study areas into two major groups: Sciences and Humanities. 4) Here is a look at some of the details of the BioFables pinwheel. 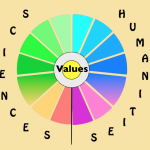 The colors on the left (Sciences) side of the pinwheel start with gradations of green at the top, transitioning into yellows; the right (Humanities) side colors start with gradations of blue., transitioning into pink. 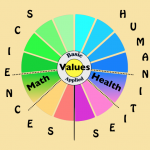 The dotted lines separate basic from applied Sciences and Humanities. The vanes between the dotted lines on either side of the pinwheel represent subjects that are cross-disciplinary, vital to many of the basic and applied study areas: Math and Health. Note that those vanes are slightly larger than the others, and that the colors are a blend of green/yellow (Math) and blue/pink (Health). Math is vital to truly understanding both sciences and humanities; awareness (and taking care) of one’s Health is vital to effective studing and learning. Math skills and Healthy practices appear in all BioFables stories. 5) The 14 vanes of the pinwheel represent Knowledge Gateways, BioFables’ major divisions of Sciences and Humanities subjects. Human Family Values servie as the pinwheel’s pivot. 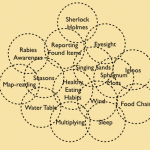 Classification of knowledge into specific categories will differ, depending on the perspective and the purpose of those doing the classifying. So will the names of those classifications. Taxonomy, hierarchies and other means of sorting the vast universe of knowledge currently available (and yet to come!) are topics outside the scope of this discussion. Our purpose here is to provide a useful way to sort out the exciting discoveries made by the Maloney twins and those around them into at-a-glance categories. 6) Discoveries are the mini-lessons found throughout BioFables. They are the most specific and detailed classification of learning, such as those presented in section 2), above. Here is the sand castle example. The pathway leads from experimenting with wet and dry sand for building sand castles to the Knowledge Gateway “Engineering” via the branch “Structures.” This is one of the simpler of the 80+ discovery pathways appearing in the Companion to Sand Sack. Narratives accompany each chapter’s specific pathways. 7) Color-coded tables and charts in the Companion Books show the distribution of subjects by chapter, and all the discovery lessons compiled by subject. All mini-lessons (leaves) trace their “roots” back to their Knowledge Gateways (vanes of the pinwheel). Pinwheels generally don’t grow leaves, however. 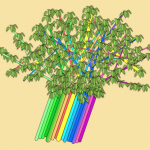 So, each of the colored vanes morph into a tree trunk and branches that are mostly-hidden by leaves (mini-lessons). The central yellow pivot sits in the middle of the Sciences and Humanities gateways. Each of the six children’s books published so far cover each of the Knowledge Gateways, although certainly in different proportions. Parents and teachers can use these graphics and the Index at the back of each Companion Book for easily identifying books that cover subjects and lessons they’d like their children to read. We hope the images we selected to represent the subjects of a balanced education help you visualize the scope of the BioFables children’s books. This website is steadily evolving to bring you increasing value. Here is a brief introduction to its main sections. BioBlog posts by BioFables book main characters provide deeper insights into their personalities and thought processes. Tables identifying topics, links to some external sources. Brief introductions to all the books, with links to purchase.